Harley-Davidson's seriousness about India and the market here has never been in doubt. From time the US market received our mangoes, the Milwaukee brand has taken thoughtful, often pioneering steps to ensure they stay at the forefront of the Indian two-wheeler market. The Harley-Davidson Street 750, their first locally made motorcycle, was a big milestone. But despite the fact that it accounts for the lion's chunk of H-D's Indian volumes, the Street 750 has been seen as having finish and specification issues. In fact, it wasn't long ago that ABS became standard on the Street 750. And now Harley-Davidson is introducing the new Street Rod to India and the world. We got to ride it, and here's what makes it tick. The Revolution X engine, as Harley calls it, remains. But Harley engineers bumped the redline up 1,000rpm to 9,000rpm and raised compression to 12.0:1. This allows the Street Rod's High Output Revolution X to make 11 per cent more of undisclosed horsepower while torque rises 5 per cent. The Street Rod also features a larger air box, new 42mm throttle bodies, and a new 4-valve engine head design equipped with high-lift camshafts and a new exhaust muffler, all of which enable higher flow of air in and out of the engine. Basically, it should go faster and feel more responsive across the band. Big changes here too! Harley made a change to both the ride height and ground clearance - both have increased - which means the bike will feel different to ride. Seat height is 765mm and the clearance is up 60mm to 205mm. But the wheelbase has reduced 10mm to 1,510mm. The company also reduced the steering angle by a significant 5° to 27° along with new 43mm front suspension. The taller ride also means you get 10°-odd extra lean angle on each side. 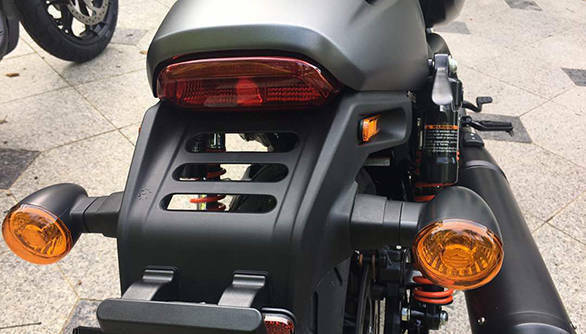 The Harley-Davidson Street Rod also gets twin 300mm discs with standard ABS. These are a sweeping array of changes and promise a dramatically different feel. At first glance, the Harley-Davidson Street Rod looks angrier and more personable than the Street 750. 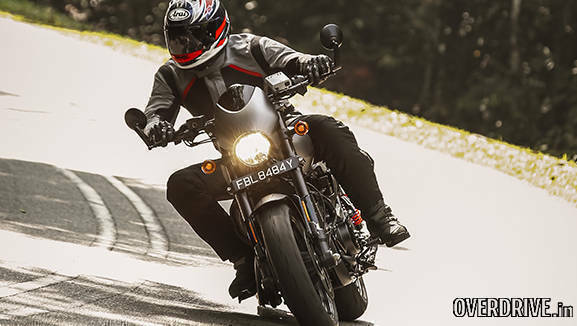 It borrows heavily from one of the concepts based on the Street 750 shown at the Auto Expo, and it's a mixed bag of street performance, drag bikes and cafe racer elements. But lead designer Chetan Shedjale's lines come together. 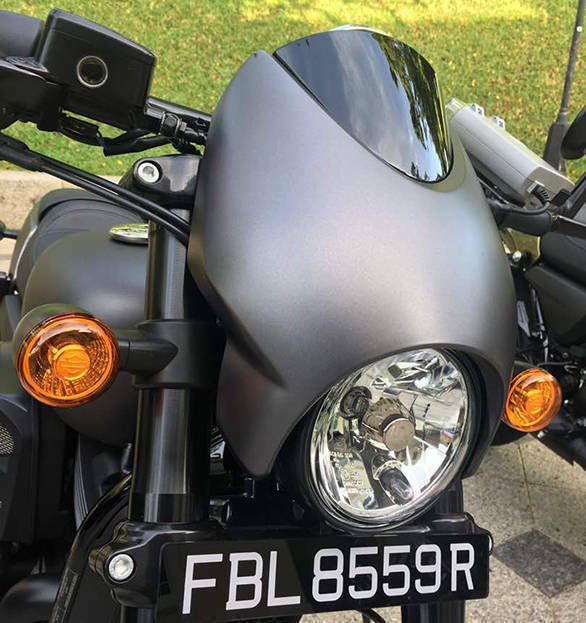 From the angry bent of the wee headlight fairing to the stubby little tailpiece, the Street Rod looks classy and is finished in ways that the Street 750 should always have been. 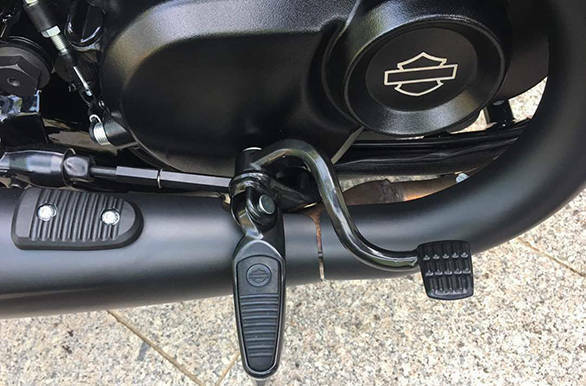 When you look closer, you also notice that the silly details like the masses of wiring or the rubber footpegs are all gone. In their place are classier-looking replacements that really elevate the sense of price and value. But how is to ride? Excellent actually. The higher ride height feels right, and the ergonomics produce a nice and aggressive riding position. It's very in keeping with the new chunkier look of the motorcycle now. And just like you notice that the wiring and details are neater, the feel of the clutch and other controls also seems a bit more sophisticated. The engine feels familiar. It's fairly smooth up to 4,000rpm after which there is enough vibration to let you know there's a V-twin that's working away. 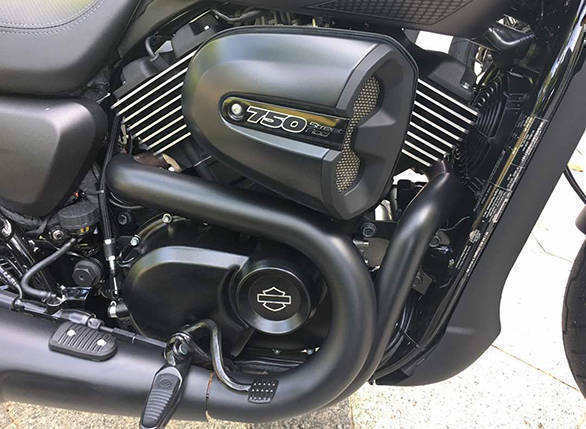 The motorcycle pulls hard from almost any revs you like, and Harley's High Output Revolution X is a rather likeable engine. The higher redline? I never went anywhere close to it on our Singapore ride but I never lacked for grunt when I needed it. It sounds good when you're following another Street Rod too. The problem I anticipate is the heat. 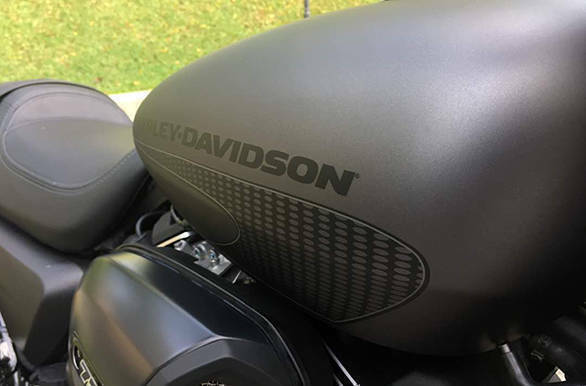 The higher compression ratio as well as the proximity of the left thigh to the rear cylinder felt very hot in the city section of the riding. I think in Indian conditions it'll feel even more, er, toasty. 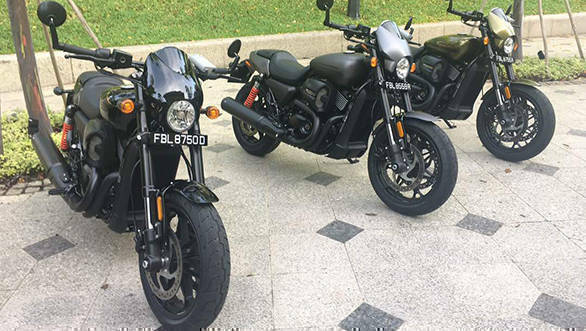 The ride quality is stiff and it isn't a problem on Singapore's fairly smooth roads. But I think in India this will prove to be a little bit stiffer than most riders will like. The higher ride height and the tighter steering geometry make the Street Rod a lot faster in the corners. The flat drag bars allow good leverage, and tipping the 'Rod over is easy and quick. The extra lean angle means scraping stuff comes later than before and all told, this is a happier, more excitable machine than the Street 750. Of course, the bikes we rode run Michelin Scorchers but the Indian models will continue to wear MRFs. 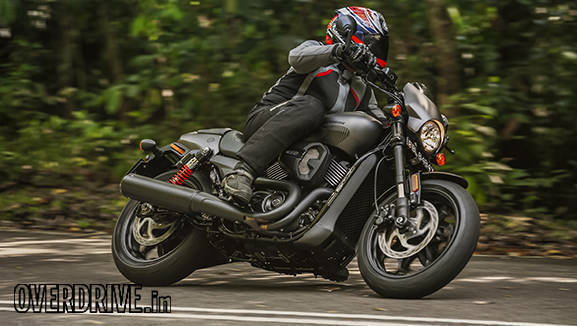 Michelin has just announced that Harley tyres, including the Scorchers for the Street Rod and 750, are now on sale in India. The brakes are good, and the feel is light and friendly. Harley-Davidson has officially launched the new Street Rod 750 in the Indian market at Rs 5.86 lakh (ex-showroom, Delhi). It may be based on the Street 750 but it's nearly new in many ways. 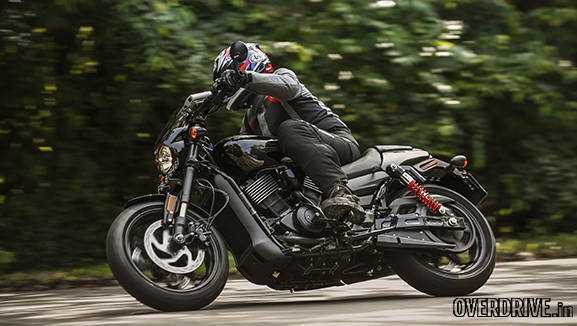 It improves upon every single parameter you can think of versus the Street 750. And at Rs 95,000 more the Street 750, this is most certainly a better deal.